Treasures of South Florida Libraries. The Ruth and Marvin Sackner Archive of Concrete and Visual Poetry. The Ruth and Marvin Sackner Archive of Concrete and Visual Poetry. In one sense the Ruth and Marvin Sackner Archive of Concrete and Visual Poetry exists in the home of Ruth and Marvin Sackner, but it is perhaps more accurate to say that the Archive is "home" to Ruth and Marvin Sackner. To cross the threshold and enter their residence is to immerse one's self in a world of art and poetry that does not end with images on walls or books on shelves. The passion and joy of sharing their home and collection with others carries visitors along an artistic and poetic journey that energizes the mind and stimulates the soul. The Ruth and Marvin Sackner Archive of Concrete and Visual Poetry is truly a shared venture, with the Sackners devoting time not already consumed by professional, family, and civic obligations, as well as to the acquisition, arrangement, description, display, and promotion of materials in their collection. Crafted out of a mutual love for modern art, Russian Avant Garde Art, the work of Tom Phillips, and other influences, the Sackners have created a unique collection and a true treasure here in Florida. Fortunato Depero. 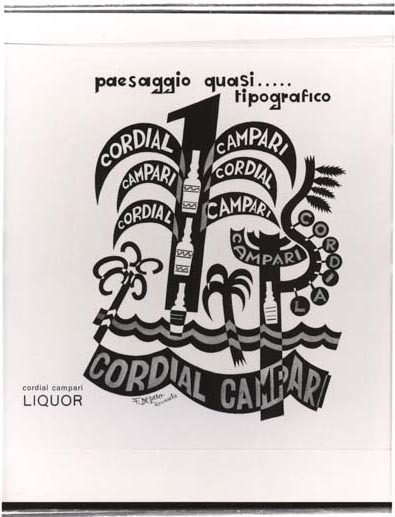 Fortunato Depero, a second generation Italian futurist painter, typographer, poet and sculptor, designed a catalog for the aperitif company, Campari. Offered total creative freedom, Depero created a volume with innovative typography, iconography, and sound poetry. The signed and dated edition was published in 1931 and acquired by the Archive in 1981. In 1984, a visiting European art dealer examined this fine example of futuristic graphic design. The dealer's surprise at finding this work in a private, Miami Beach collection, began a discussion that culminated with the Archive's acquisition of the artist's maquette for the book. The maquette, that is, the original art work created for the volume, contains illustrations that do not appear in either the published work or in any of the drafts that were revised prior to publication. 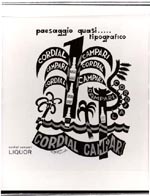 The original artwork, as a unique creation, is unavailable elsewhere, including the Campari Company library. Campari. [n.p.] 1931. Campari. [n.p., n.d.] Maquette. Watercolor, pen and ink, and pencil. Guillaume Apollinaire. Peintures de Leopold Survage, dessins et aquarelles d'Irene Lagut: premiere exposition des "soirees de Paris": catalogue avec deux prefaces de Guillaume Apollinaire, chez Madame Bongard, 5, Rue de Penthievre du 21 au 31 Janvier 1917. Two copies, one copy handcolored. The calligrams of Apollinaire represent an important and original landmark in the history of visual and shaped poetry. These calligraphic poems may be considered as one of the precursors of modern concrete poetry. As such, they illustrate the historical roots of the Sackner Archive. Marvin Sackner located the rare, hand-colored version of this publication, issued in an edition of ten copies, in an obscure German auction catalog in 1988. The twelve shaped, hand-colored calligraphic poems of Apollinaire demonstrate what scholar Wilfred Bohn described as Apollinaire's visual criticism of Leopold Survage's work. Two additional copies of this edition are available in the Bibliotheque Nationale, Paris, and the Columbia University Rare Book Library, New York City. The folio has received conservation treatment due to the acidity of the paper. A copy of the uncolored edition is also in the Archive. A comparison illustrates the contrast between the two versions and emphasizes the unusual scope and content of a most remarkable collection. Tom Phillips. A Humument. Two drawings. Pen and ink, gouache, collage. The paintings, sculptures, books, prints, and drawings of British artist Tom Phillips are central to the Archive, in both the physical and intellectual sense. Prominently displayed in the Sackner home, these works serve to welcome the casual visitor or the expert analyst. To understand and appreciate the Archive, one must recognize the significance of Tom Phillips and his work. Phillips began his artist's book masterpiece, A Humument, in 1966. To create this treasure, he selected an 1892 Victorian novel, A Human Document, by W.H. Mallock. Phillips then hand-treated each page of text with gouache paint, engraving or collage, leaving pre-selected words or phrases uncovered. Each page may be viewed separately, although the complete book, both the artwork, and the reconstructed text left visible, tells the romantic story of a hero, Bill Toge, and a heroine, Irma. The Sackner Archive holds the original A Humument. In 1980, publication of a trade edition by Thames and Hudson brought Phillips' work to public attention. This edition sold out, and in 1987 Phillips published the first revised edition, with fifty newly-created pages. The artist intends to change fifty pages with each subsequent edition, ultimately creating an entirely different work. Leandro Katz. Word Column IV: Puno/Altamira; Word Column XII; Section I. 1971. Typewriter with stand and typescript scroll. Typewriter art and typewriter poetry hold an important niche in the Archive. As a recent development in the landscape of literature and art, this form may soon disappear entirely, dwarfed by the emergence of computer art and computer poetry. The works of individuals including Kurt Schwitters, Henri Chopin, Dom Sylvester Houedard, William Jay Smith, and others was created on manual typewriters, instruments already foreign to a generation of young poets and artists. The use of black, red, or colored ribbons often enhanced the creative process. In this piece, Leandro Katz, an Argentinean poet and film maker living in New York City, used a large face Royal typewriter of the 1960s. The Japanese rice paper scroll consists of Spanish words selected at random; a smaller scroll of English words also exists. The appearance of single words emanating from the typewriter gives the work a sculptural quality.